We are in that magical final month of the school year. APs start next week, Finals not long after. And then, some rest. Or not. Summer is something so many families and students get wrong and we want to help our readers get it right. Here are 4.5 guidelines to help you make the most of your summer. We all know that SAT/ACT scores and GPA are massively important as part of your college application. But did you know that jobs matter too? Jobs indicate to colleges that you have taken on an additional level of responsibility and that you have had some experience in the working world before plunging into university-level studies. For you, the rewards are significant: a chance to earn some money (never a bad thing to start saving for college), an opportunity to make new friends, a chance to learn a new skill, and finally, a look into what real-life-work is like. Would it be nice if your job had some relationship to what you want to study in college or do with your life? Sure! But if not, any job is still a good experience (even if you don’t like it, you still learn about what you don’t like!). There are lots of reasons to take at least one class during the summer. The two most important are the opportunity to skip ahead in high school and the option of knocking a college class out of the way now. Let’s say you want to take Calculus in the Fall but you were in Algebra II this last year. That means you need Pre-calculus. What if you took it during the summer? Most community colleges will offer a class that covers the material. Make sure that your school allows you to skip ahead, however. Some schools have policies in place that prevent students from using this strategy. Better to check with your high school counselor and learn the requirements before you pay for the class. Another situation: let’s say you’ve just taken Biology and you’re due up for Chemistry. Maybe you want to take Chemistry over the summer and go right into Physics. Or maybe you want to take AP Chem and want to have your first year of Chem done before taking that class (a must, really). Either way, if your school approves, you can take a community college class, not a high school class. For the simple reason that, as long as the college you take the class at is accredited, many colleges will take the credits you earn – if not as part of your core requirements, at least as an elective. You’re going to save money, save time, and open up more options for yourself for your high school (and college) course load. Also, remember that if you are in “school mode” just by taking one class over the summer, getting back into the groove in the Fall semester will be easier. Our recommendation – 1 class maximum. Remember that summer classes cover an entire semester in either a 4 or 8 week period, so each class session os longer and there is more material to learn in a shorter time span. This is really up to you. You could volunteer or go away on some adventure for the entire summer. And remember, you have 4 summers in high school so you don’t have to do the same thing every year, but realize that if you pick an out-of-town option you necessarily have to rule out numbers 1 and 2 on our list. And believe me, adventures are worth the sacrifice. By the same token, if you were to go on adventures every summer and were to neglect work or class opportunities that would be shortsighted. This is the most neglected item on this list. Parents and students try to pack summer schedules and forget that recovery time – in athletics, in school, and in life – is the only way to make the “regular time” more productive. For every 4 weeks in the summer, make sure that you have at least 4-5 days where you can relax. No homework, no special things. Just time off. Our recommendation – Take at least one real day off every week. We mean it! So I bring my personal experience with stacks of AP assigned reading when I was a high schooler (back before the dinosaurs had gone extinct) as well as observance of my very best students over the last decade to this point. I don’t think you should worry about this until 10 days before school starts. Now, this isn’t going to endear me to all the high school teachers who tell you “not to put this off.” I just find that after a full year of pushing hard at school that there is ZERO appetite or desire – even among my best students – to pretend like the school year doesn’t end over the summer and “dig into” summer reading even a month after school ends. So rather than be unrealistic, I choose to be pragmatic. Our recommendation – Start your summer reading – seriously and earnestly – no later than 10 days before school starts. We hope these tips help and we hope it presents the right balance of work, study, and fun for your well-deserved block of time off! Stephen Heiner is a Tutor at Get Smarter Prep. 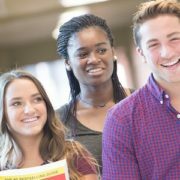 College Abroad? Does It Make Sense for You?